As Zimbabwe enters a new period of governance, and euphoria grips the country, investors are already looking south of the border for potential investment opportunities in South Africa. Following a recent agreement between Zimbabwe and South Africa to strengthen economic ties, (as reported here by The Herald in Zimbabwe), investors are likely anticipating further constructive talks. Over the coming months, as the incumbent President, Mr Emmerson Dambudzo Mnangagwa brings his voice and vision to Zimbabwe, investor “euphoria” could paint a bullish picture. 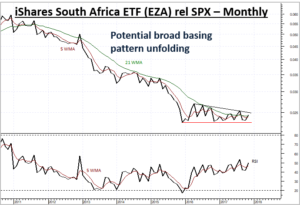 This will help bolster sentiment in South Africa, and could lead to a rally in South Africa equities. One way for investors to take advantage of this exuberance is via the iShares MSCI South Africa ETF, (EZA). In fact, EZA prices have been rallying sharply over recent days, as news of a change in presidency in the Zimbabwe capital, Harare, grew. As the chart shows, since late 2016, price action has been extending higher within a well-defined rising trend. The strengthening Tension Indicator and RSI highlight potential further gains in the coming months. 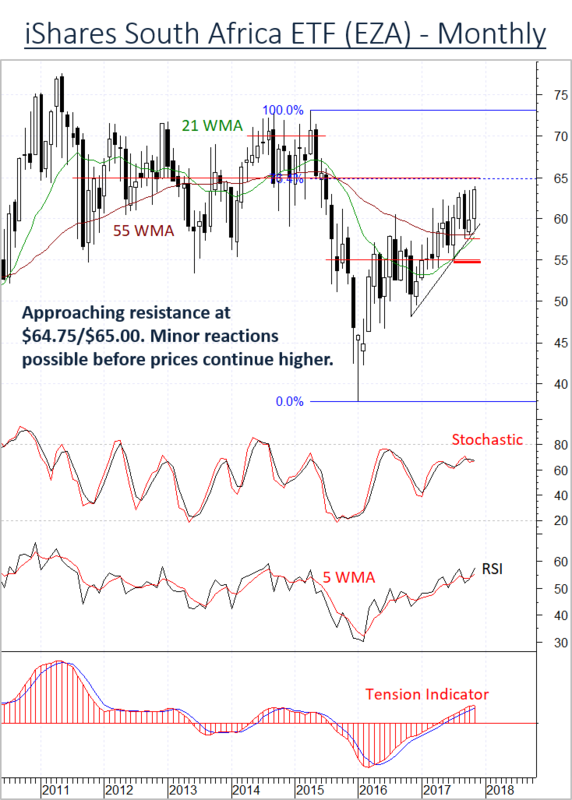 However, resistance at the 64.75, (76.4%) Fibonacci retracement of the 2015-2016 fall, and congestion around 65.00 could provide reactions and promote short-term consolidation. Later clearance of here, however, will add fresh impetus to investor sentiment. Subsequent gains will open up psychological resistance at 70.00, as the broad 2016 rally continues to extend. Support is at the 57.58 low of September. Still lower are congestion around 55.00 and the 54.81 low of July. A close below 54.81/00 is needed to negate higher levels, and turn sentiment negative. 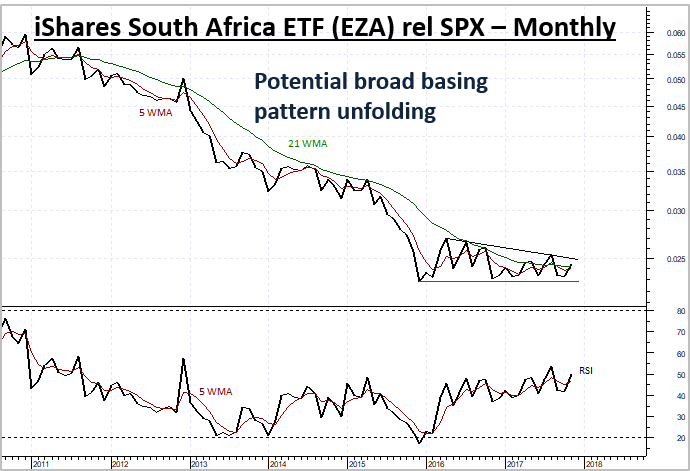 From a broader perspective, the iShares MSCI South Africa ETF is showing signs of stabilisation relative to the S&P500 Index (SPX). Following multi-year underperformance, there are signs of stabilisation appearing in EZA as prices consolidate above December 2015 year lows. 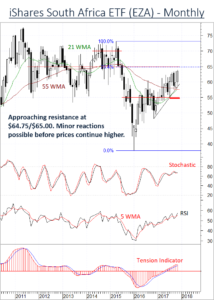 Rising momentum studies highlight a potential break higher in the coming months. A close above overhead trendline resistance would improve price action. This would lead to fresh USD inflows as investors reduce exposure in US Equities. In the coming months, we anticipate investors will increase their exposure in South Africa related instruments, to take advantage of potential economic and social improvements in Zimbabwe. They will be monitoring the news closely, as developments in Harare could come quickly and without warning. Because of uncertainty and heightened volatility, this “political trade” will need to be monitored with extra diligence. US Technology Sector (XLK) Outperforming S&P500. But is the trend maturing?